The event underscored the important role that companies and investors in the Philippines have to play in strengthening natural capital and ecosystems – the last line of defense in the fight against to climate change. Natural infrastructure solutions, such as investing in the conservation and restoration of mangroves, coral reefs and forests, can provide a cost-effective solution and innovative area of opportunity for Philippine companies, banks and insurers. The workshop was convened as part of ESG 2-year project funded by the International Climate Initiative of the German government, to mobilise new opportunities for business, policy and development leaders to deploy commercial capital in a way that delivers greater social and environmental resilience to climate change. 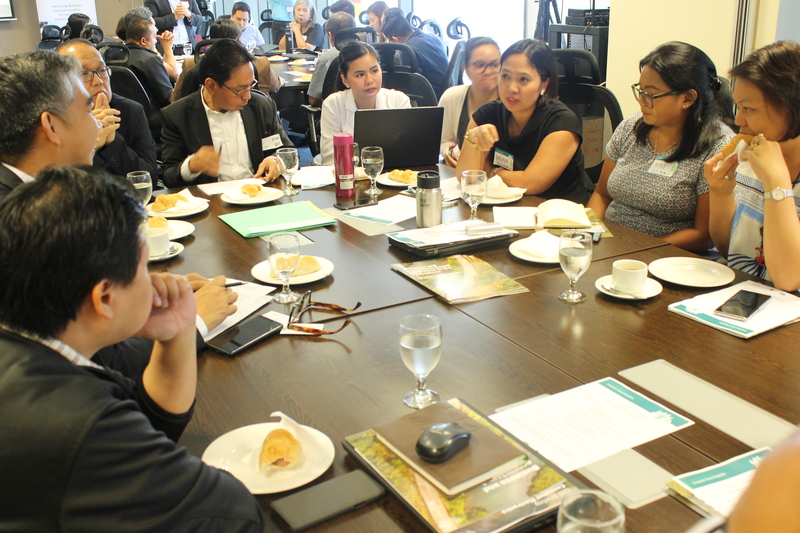 ESG has been providing the analysis of possible solutions and building a network of individuals and organisations in the Philippines committed to collaborate on cross-sector models. The workshop was co-convened with ESG’s partners in the Philippines: the Philippine Business for the Environment (PBE) and the Asian Institute of Management (AIM). It was hosted by Aboitiz Group at their headquarters in Manila, and counted with the strategic participation of the Climate Change Commission of the Philippines. 1. A national fund to pool corporate investments in local ecosystem adaptation, which will enable companies to co-fund and collaborate in a territorial area, in alignment with local government units and government-designated biodiversity areas. 2. A business incubator for new enterprises to accelerate ecosystem-based adaptation (EbA), building on leading technology developments, facilitates enterprise collaboration between entrepreneurs, business groups and public agencies. 3. Commercial bank policies to integrate investment in ecosystems services, a collective effort of leading banks in the Philippines to introduce ecosystem values and resilience into their credit policies and investment portfolios. 4. Pricing the value of ecosystem resilience in insurance premiums in the Philippines, enabling the insurance sector in the country to incentivise the protection of ecosystems through their risk modelling and valuation for insurance products. ESG, its local partners and workshop participants that have taken the active commitment to host and develop these proposals will be working to further develop these outcomes. We will re-convene in Manila early in 2019 in a second workshop to follow-up implementation. This project is part of the International Climate Initiative (IKI). The German Federal Ministry for the Environment, Nature Conservation and Nuclear Safety (BMU) supports this initiative on the basis of a decision adopted by the German Bundestag.